This is what our customers are saying about us! Apa Design prides itself on customer service. Our clients come to us for an experience that a store cannot offer. We work with our clients to create pieces that will be with them for the rest of their lives. Whether it's a wedding or engagement ring or that perfect pair of earrings for your mom, Apa Design will help make a memory that will last forever. My husband and I have hired Andrea a number of times. The biggest project we did with her was the design of my engagement and our wedding rings. Despite the fact that this is often both an exciting and stressful time for most people (often with lots of last minute changes), Andrea remained on top of things. She had a lot of great ideas and really helped make the process easy and enjoyable. The end result was better than we could have ever imagined!! We never thought we could have such beautiful and unique rings within our budget but she really made it happen! Thank you Andrea. I am so in love with my rings. Thank you so much for making such a unique piece of art for me to wear for the rest of my life I cannot believe it came out so perfect. I look at it everyday and cannot stop. "I had Andrea create a custom brass necklace for me. Her process was extremely efficient and my expectations were blown away. She is professional, creative, imaginative, and has honed her craft to perfection. Andrea also provided great value for her services and I have had nothing but compliments on my beautiful piece. I have already and will continue to recommend her to anyone who, well...loves jewellery!" "I worked with Andrea to have an engagement ring designed and created in 2011. We began by talking about what I was looking for in a ring and sketching ideas about how the ring should look. She gave me lots of concepts drawings and designs until we had a chosen a design I loved. She then created a 3D model of the ring to give me a better idea of what it will look like and was more than willing to make changes based on my ideas and suggestions. I also had opportunity to look at the wax of the ring and a chance to make suggestions and tweaks to the ring. 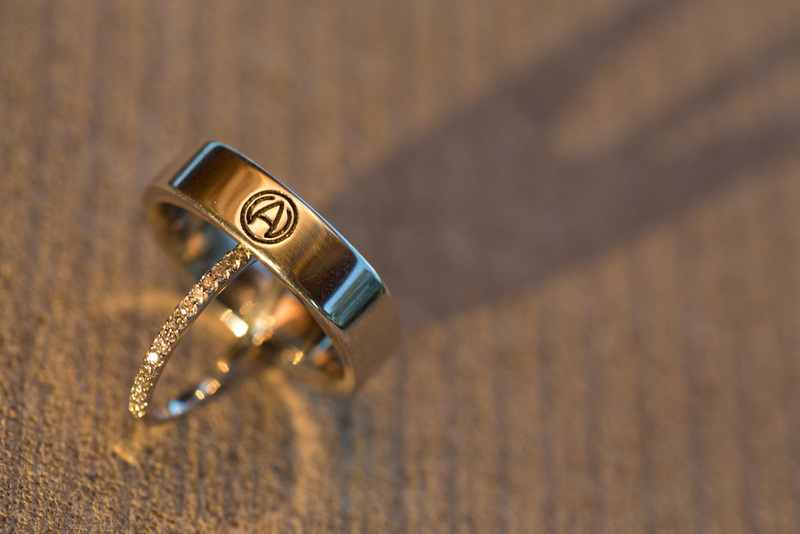 The final result is a fantastic and high quality ring which has made my fiancee very happy. Andrea is highly creative and personable making the whole experience a lot of fun. Great value, and always delivered on time. I would highly recommend Andrea for jewellery work in the future and will be a return customer for many years." "When I decided I wanted custom-made wedding bands to accompany my engagement ring, Andrea was able to help me through the entire creative process. She was able to take the existing design of the engagement ring and produce a double band design that paired perfectly, providing me with a truly unique result! She was also able to design for me elegant chandelier-style earrings to wear on the wedding day, which was important to me as I have 0-gauged ears and find it virtually impossible to find elegant jewelry for stretched lobes. Not only were the earrings beautiful, she also matched the style to the beading and embroidery details of my dress. Andrea was always professional and is creative in her design process. I would recommend her to anyone looking for something unique and special." "Andrea designed a fantastic custom piece as a special Christmas gift for my girlfriend (now fiance). She was very easy to communicate with, and worked with me to determine exactly what kind of piece I was looking for. She worked on developing some ideas, and presented a number of excellent initial designs. She continued to refine further until the final piece was completed. Throughout the process she was great to communicate with, worked to make exactly what I was working for, and always went the extra mile to make sure that I was a satisfied customer. I am pleased to say that I have bought other pieces from her, and will continue to do so in the future." For my wedding, I wanted a thank you gift that was personal and unique. Andrea was able to incorporate not only the fall theme of the wedding, but also used the gold leaf sheets that my father had given me (which he had used in cabinetry work). The result was lovely gold and silver leaf earrings that my bridesmaids wore for the ceremony. Thanks Andrea!